What is included in your SEO Services? 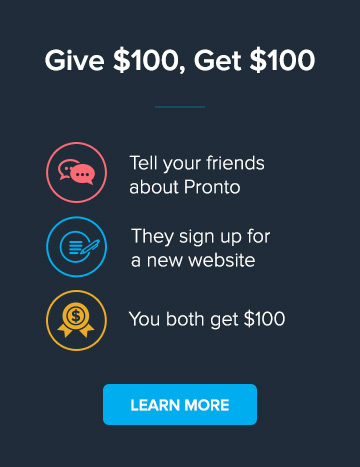 From the moment you sign up with Pronto, we start working on your SEO. We use our wealth of experience and knowledge to help you determine which locations and keywords your site should target and plan a solid SEO strategy. Throughout the process, we do all the heavy lifting. We strive to make SEO as easy as possible for you. Want to target a new keyword? Just shoot us an email and we'll take care of everything. Our SEO strategy isn't only about setup and planning. Once your site is up and running, we continue to work with you, monitoring rankings and traffic, adjusting keywords and tweaking optimization. SEO can be a slow, time-consuming (and at some points, very frustrating) process. But we love it. We love putting in the hard work and seeing the results of those efforts. Nothing makes us happier than working with a new client who has struggled with SEO in the past and helping them finally break through to Google's first page of results. On-page Optimization - we provide unique content with proper keyword density, optimized title tags, descriptions and keywords, quality site structure and sitemap allowing easy access for search engine bots. Monthly Reporting - every month, you'll receive a report including rankings for a sample of keywords, traffic analytics and more! Google Analytics - we install Google Analytics on your site, giving you access to detailed traffic reporting and trend analysis. Local Search - we submit and maintain your business listing on Google Places, Bing Business Portal and Yahoo! Local which draw more traffic to your site through local search results. Business Directory Submission - for an additional fee of $150 per year, we submit and maintain your business listing on 100+ local business directories, increasing local citations and as our research as shown, increasing search traffic by an average of 14%. Highly recommended for all Pronto clients! Learn more!